The Doodle Scrub goes where you can not! The Doodle Scrub was created and designed specifically for those out of reach areas that our bigger Square Scrub machines can not reach. Square Scrubs NEW patent pending EBG-9 handle innovation gives you not just ONE but TWO ways to attach the handle to the base, giving this machine and its user maximum versatility. The Doodle Scrub is perfect for cleaning and preparing floors around toilets, bathroom stalls and similar tight spaces where larger machines can?? ?t reach. 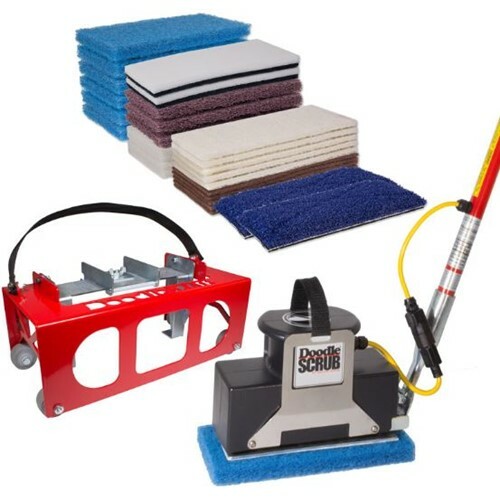 The Doodle Scrub is also great for cleaning stairs, VCT, tile and grout, rubberized flooring, and much, much more.